There is no such thing as being overdressed. If you follow me on IG (here) you would have noticed that I recently went on a little holiday to Europe. 15 years in the making and it exceeded all expectations! 5 weeks of feasting, fashion and frivolity. 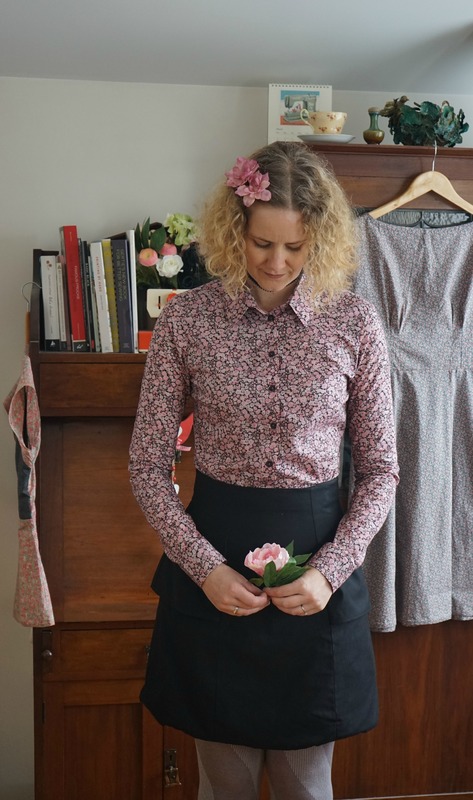 I was lucky enough to stay with one of my dearest friends in Berlin, travel to Paris for 4 days, head over to England for 5 days to hang out with one of my best sewing buddies and then back to soak up Berlin for another two weeks. Whilst I got up to some spending at Liberty of London, my choices for fabric purchasing in Berlin and Paris were rather restricted (and thus subsequently restrained). How lucky am I then to be able to recreate a little bit of Paris with this dress in my home town of Geelong? 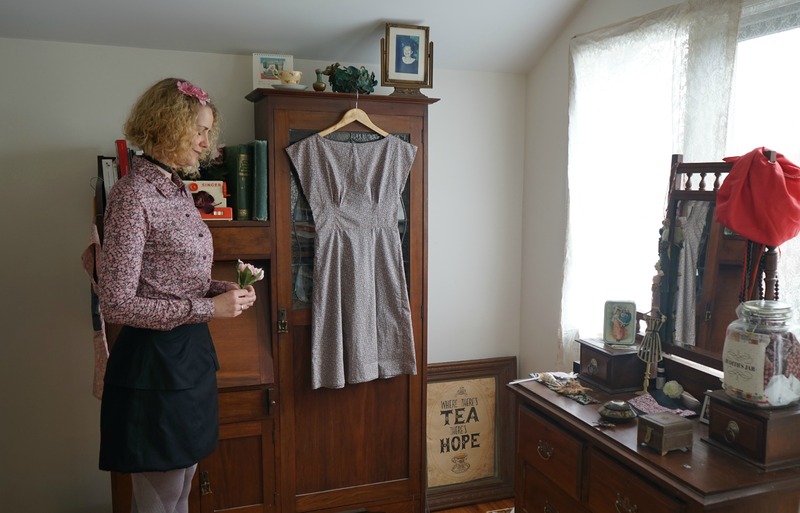 The fabulous Lilypond is a firm favourite in this small town of mine, specialising in all things French including vintage haberdashery, special homewares and the odd religious icon. On one of her more recent trips to France, Mrs Kim bought back this delicious vintage rayon which I suspect was made in the 1950’s. 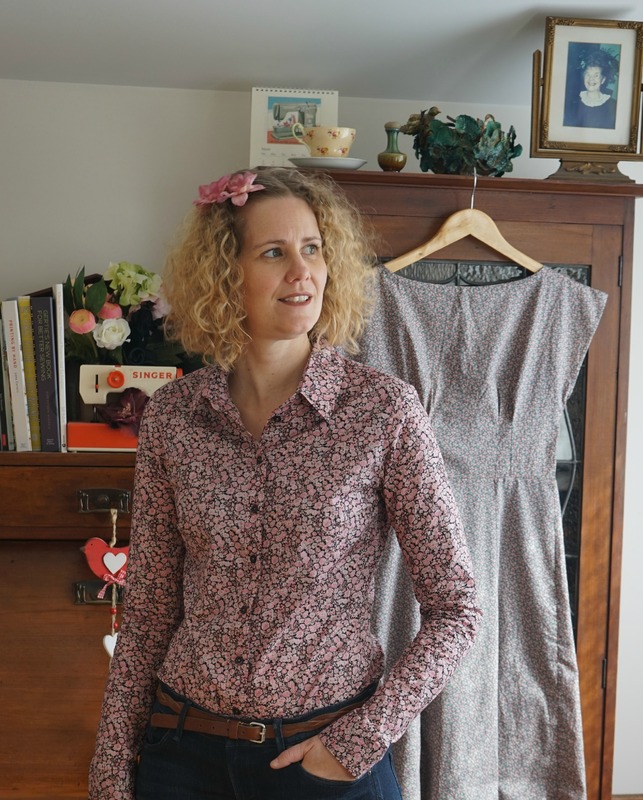 I’ve missed sewing with vintage fabrics so was quite taken with the print and hand of this fabric. The modern aesthetic of the Assembly Line Tulip Dress pattern has been calling me with its clean lines for structured fabrics. But I’ve discovered it also lends itself to a more drapey fabric with a vintage feel. The bust darts coming down from the neck line sit really well, with the bodice being a looser fit than I usually wear. 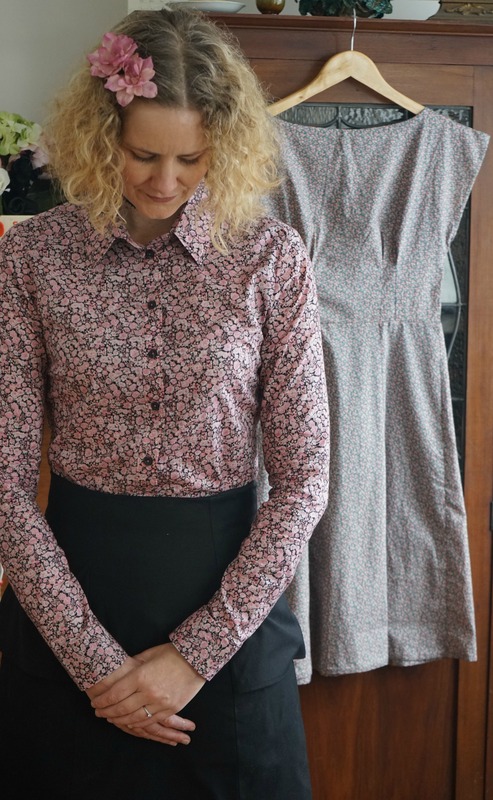 I sewed a size M noting that the dress would have some ease, and ended up taking out about two inches from the centre back seam to get a slightly closer fit. The skirt is a beautiful tulip shape which lends itself to both structured and drapey fabrics, I think. I lined the bodice in silk satin and hand picked the zip so it feels like a dream to wear. In keeping with the French theme, Bruce captured these images at Lilypond this afternoon amongst the festive decorations and homewares. I think it’s made me look forward to Christmas this year. Photo cred: Bruce. Location: Lilypond. Vintage fabric from Lilypond. Tulip Dress pattern from The Assembly Line. Flower crown from Net-a-Porter. Boots from American Duchess. Tights by Wolford. Some days a lady just wants to be wrapped in pajajays that feel like cotton and silk and cashmere combined. That they look pretty, feel comfortable and evoke snuggliness which allows one to wallow a little in fatigue and weariness in style. And brings a wee smile to my face. These were a very quick make. I used a vintage brushed cotton purchased from A Piece of Cloth recently. So snuggly. The bottom is based on the Margot Pyjama pants from Tilly and the Buttons. I sized up two sizes (the recent expansion of fleshiness on the derrière means the need for extra comfort and room is heightened). I also widened the leg to reflect a more 1920’s beach pyjama style. And I chose elastic for the waistband instead of the recommended ribbon. The only time that this notion is acceptable. And the only time I will say this. The top is my cami pattern I have developed and made many over the summer. The lace is from a french bodice in the early 1900’s that had the main part of the camisole removed. That it has survived in such immaculate condition over 100 years is breathtaking. Lily Pond has a wonderful supply of antique laces from France. I have to limit my visits as otherwise I would buy ALL the lace. Tired and Fuzzy! We’ve all been there…. The fatigue is showing in my face in these photos, but this is the reality of my life. And given I’ll be wearing these constantly, these were the best pics I was going to get. Such comfort to sleep in. Another day, and more gorgeous fabric! 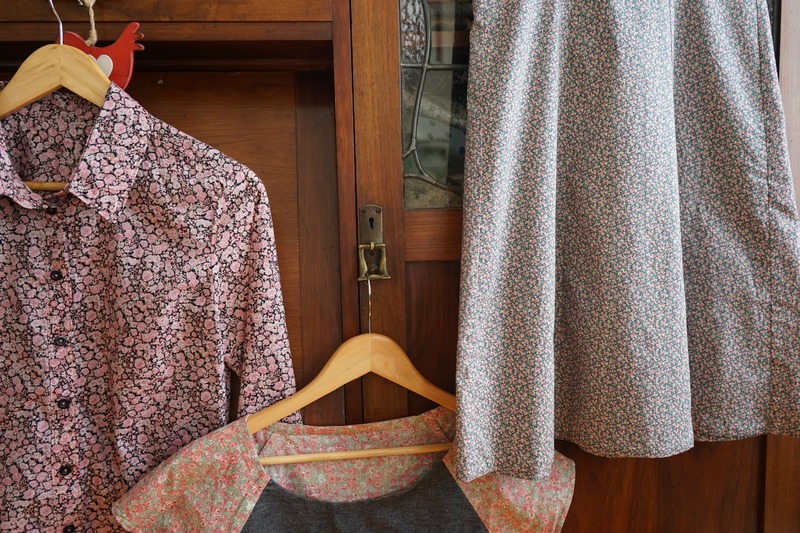 It seems like I’ve come to the end of my vintage Liberty which is sad in some ways but also wonderful to see new life given to fabric that has been stored and loved for many years. I’ve saved every scrap, and have taken to weave wrapping for gifts and hoarding hexagons for a quilt. I can’t recall ever being so attached to fabric before. Today I received a beautiful thank you card, thanking me for my thank you letter from my benefactor. This of course requires another thank you note to thank Ms J for thanking me for my thank you. I discovered that I was made custodian of three generations of fabric, *swoon*. This is sewing love. And this is why I love sewing and the sewing and fabric community. As soon as this fabric was presented to me (in a most queenly fashion followed by squeals of delight) I knew it was destined for a shirt. Fabric often speaks to me (just don’t tell my doctor) and I was overcome by the print and the softness of the Liberty. It could not have found a happier home than mine. 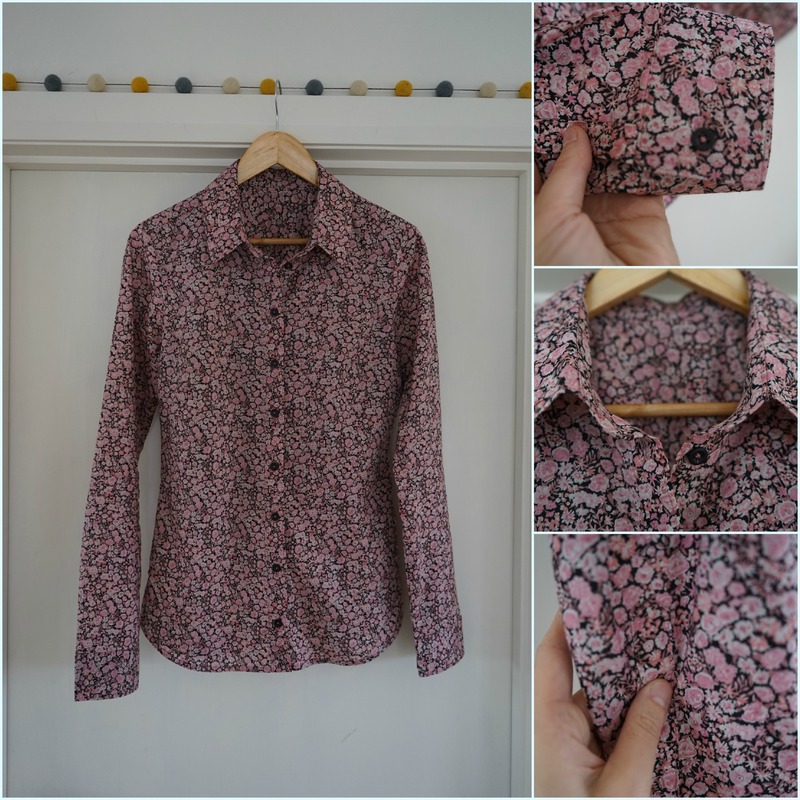 Another Granville shirt from Sewaholic. The only adjustments I need to make to Sewaholic patterns are to add length in the body and sleeves. Then the fit is perfect. Dream patterns. I’ve still got a little way to go until I perfect my plackets, but I’m happy with the result this time. And the skirt! Completely forgot that I’d made it months ago. How does one do that? 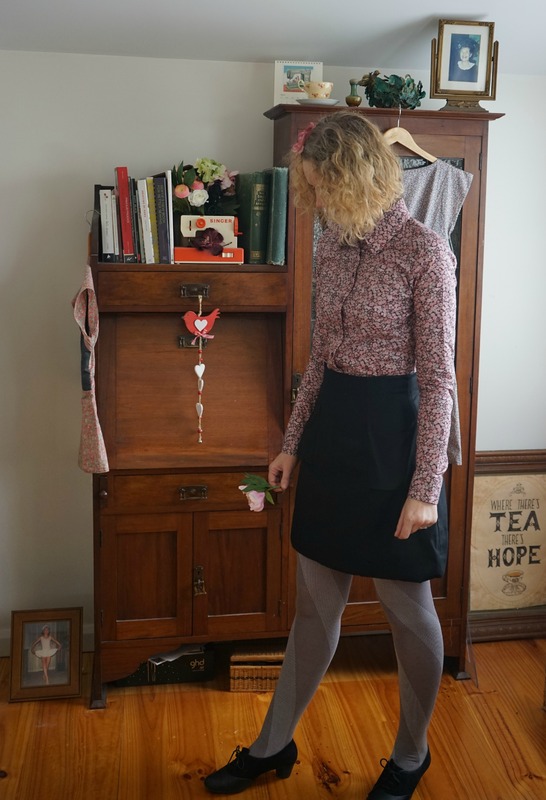 Trying to embrace new shapes and expand my handmade wardrobe I ventured out to the Anemone pattern from Deer and Doe using some left over viscose purchased from The Fabric Store. 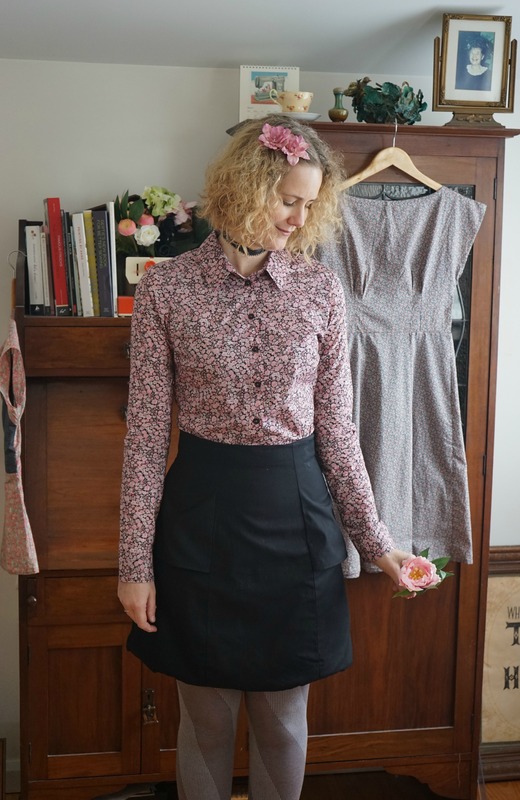 Several versions of these have popped up in my instagram feed and I had planned to experiment with the more fitted, higher waist skirt and shift away from the usual fit and flare. I think after seeing it in photos I’d wear it to work. And perhaps give it another press. It did spend the last 6 months balled up in my tops draw… Eek. And how could anything look bad with that shirt! See that waist to hip ration? That’s why Sewaholic patterns are made for my bosom, waist and derrière measurements. The skirt was fully lined, and I love the peplum on the sides. A rather pretty point of interest that is quirky and doesn’t add volume to the hips. So next time you see any vintage Liberty here, it should be in the form of hexagons. Unless of course anyone has a stash they would like to gift to me. I would be happy to oblige. Photos by Bruce. Fabric gifted from the estate of Ms J. Hair flowers from Gardens of Whimsey. Shoes from Camper. Tights from Tightology.